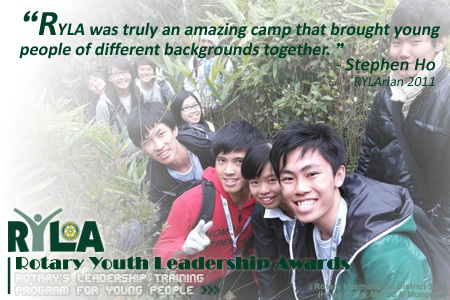 It is our great honour to announce that Stephen Ho Wing Tat, is being selected as the Best RYLArian 2011 in RYLA 2010-2011. He will represent Rotary International District 3450 as a youth delegate to attend the Rotary International Convention 2012 in Bangkok, Thailand. While for the First Runner-up of Best RYLArian 2011, we are glad to have Crystal Wong Mung Ni as the receipient.